Neisseria meningitidis serogroup B (MenB) is a leading cause of sepsis and meningitis in children. No vaccine is available for the prevention of these infections because the group B capsular polysaccharide (CP) (MenB CP) is unable to stimulate an immune response, due to its similarity with human polysialic acid. Because the MenB CP bears both human cross-reactive and non-cross-reactive determinants, we developed immunogenic peptide mimics of the latter epitopes. Peptides were selected from phage display libraries for their ability to bind to a protective anti-MenB CP mAb. One of these peptides (designated 9M) induced marked elevations in serum bactericidal activity, but not polysialic acid cross-reacting Abs, after gene priming followed by carrier-conjugate boosting. Moreover, the occurrence of bacteremia was prevented in infant rats by administration of immune sera before MenB challenge. 9M is a promising lead candidate for the development of an effective and affordable anti-MenB vaccine. Meningococcal disease is a major health problem worldwide. It occurs as sporadic cases or recurrent epidemics of sepsis and meningitis predominantly affecting children and adolescents (1). Mortality and permanent disability rates are high, even under optimal health care conditions (2). The causative agent, Neisseria meningitidis, is a Gram-negative encapsulated bacterium classified into different groups according to the chemical composition and immunogenic properties of the capsular polysaccharide (CP2; Ref. 3). Serogroups A, B, C, W135, and Y account for >95% of infections. Serogroup A strains cause epidemics in sub-Saharan Africa, whereas serogroups B, C, and Y predominate in Europe and North America (4). Effective vaccines consisting of CP or CP-protein conjugates are available for the prevention of infections caused by group A, C, Y, and W135 strains (5, 6). However, no capsule-based vaccine is available for the prevention of infections caused by N. meningitidis serogroup B (MenB), which is highly prevalent in industrialized countries. This problem is caused by the poor immunogenicity of the MenB CP, even after protein conjugation or inclusion in outer membrane vesicles. It is likely that the immune system tolerates the MenB CP because of its similarity with human polysialic acid (PSA), both consisting of repeating units of two to eight linked sialic acid (7). Studies with mAbs have convincingly demonstrated that, in addition to human cross-reactive determinants, non-cross-reactive epitopes are also present on the MenB CP (8, 9, 10). These findings opened the possibility of developing mimics of the latter epitopes with the aim of inducing protective anti-MenB Abs, while at the same time avoiding the risk of autoimmunity. Indeed, such mimics, in the form of anti-idiotypic Abs raised against non-cross-reactive anti-MenB monoclonals, could induce protective anti-MenB responses after immunization (11, 12). We previously focused on recombinant anti-idiotypic Abs in the single chain variable fragment (scFv) format (11, 13, 14) and showed that it was possible to increase the immunogenicity of MenB CP mimics by using different DNA immunization strategies (15). However, one of the potential disadvantages of the anti-idiotypic approach, even in the scFv format, is the presence of unwanted and potentially immunogenic determinants, such as those of the framework regions of the variable domains. Although the ability of these determinants to produce untoward reactions has never been shown, MenB CP mimics containing only the desired immunogenic epitopes would be more suitable for vaccine development. The ability of some peptides to mimic functional characteristics of bacterial carbohydrate Ags has been repeatedly shown in recent years (16, 17, 18). The identification of such peptides has been facilitated by the use of random peptide libraries displayed on the surface of bacteriophages (19, 20, 21, 22). Using this technique, peptides capable of competing with the nominal Ag for Ab binding can be isolated with relative ease. Quite often, however, these mimics are not immunogenic (16, 23). We describe here the isolation of peptide mimics of the MenB CP capable of producing significant bactericidal responses after immunization. Priming with DNA vectors followed by boosting with conjugates was particularly effective at inducing a protective, Th1-type Ab response. The meningococcal strains (MenB 2996, MenB 8047, MenB MC58, MenA F8238, MenA A1, and MenC C11) used in this study, were provided by M. M. Giuliani (Novartis Vaccines and Diagnostics, Siena, Italy). Purified MenB CP (N-propionylated form), Seam 3, and Seam 26 mAbs were provided by A. Bartoloni and M. Mariani (Novartis Vaccines and Diagnostics, Siena, Italy). A synthetic peptide (NH2-AEGEFDYAWDQTHQDPAK), containing the 9M sequence was obtained in keyhole limpet hemocyanin (KLH)-conjugated form from GenScript. The pT.scFvG1 vector, encoding for the G1 scFv, was prepared as previously described (15) and used as a positive control in immunization studies. Anti-MenB rabbit serum (Difco; N. meningitidis antiserum group B) was purchased from Voigt Global Distribution. Biotin-conjugated goat anti-rabbit IgG was purchased from Abcam. Peptides were selected by using two different phage libraries carrying random inserts encoding peptides of 12 and 9 aa, respectively, fused to the N-terminal region of pVIII, the major coat protein of the filamentous phage. Details on the construction of the libraries, designated as pVIII-9aa and pVIII-12aa, have been already described in detail elsewhere (20, 21). Specific phage particles were selected from the libraries by three rounds of affinity selection, as described (18), using mixtures of the mAb Seam 3 (1 μM to 10 nM) and 1010 ampicillin transducing units of each library. Positive phage clones were identified through plaque immunoscreening, as described (18). Interaction of the selected phage clones with Seam 3 mAb was tested in enzyme immunoassay, as described (18), using plates coated with rat anti-pIII (coat protein III) mAb (1 μg/ml) followed by addition of purified supernatant phage (1010 PFU/ml) and by Seam 3 or isotype control (1 μg/ml). Binding was detected with alkaline phosphatase-conjugated goat anti-mouse IgG Ab (1:5000; Sigma-Aldrich) using p-nitrophenyl phosphate as substrate. To verify specificity of binding, Seam 3 was preincubated for 1 h with 1 μg/ml MenB CP. After adding the Ab-CP mixture, the enzyme immunoassay was completed as described above. To generate plasmids for DNA vaccination, we used pCI-neo, a mammalian expression vector (Promega). Table I⇓ summarizes the inserts contained in the vectors used in this study. Oligonucleotide sequences encoding the immunogens were optimized for murine codon usage. All gene inserts encoding the desired peptides were obtained from MWG Biotech as synthetic complementary oligonucleotides. After hybridization, the double-strand oligonucleotides inserts were ligated into the multiple cloning site of pCI-neo, obtaining the plasmids vectors for DNA immunizations studies. A leader sequence (24) and/or a tetanus toxin universal T cell helper epitope (25) sequence were inserted at the beginning (i.e., at the 5′ NheI/EcoRI flanking site) of the plasmid vector to obtain secretory or T cell helper peptides. In preliminary experiments, we tested different recombinant cytokines, including IL-12, IFN-γ, and TNF-α, for adjuvant activity after coadministration with DNA immunization vectors. Because IFN-γ was consistently effective, we generated an IFN-γ-expressing plasmid to be used in coimmunization experiments. To produce such a plasmid encoding for murine (m) IFN-γ, the IFN-γ gene was PCR amplified from BALB/c splenocyte cDNA. The PCR product was cloned into the pCI-neo polylinker at EcoRI/XbaI sites, giving the a plasmid encoding for murine IFN-γ (pmIFN-γ). The ability of this plasmid to express IFN-γ was verified by measuring its concentration in lysates of transfected COS-7 cells using the ELISA murine IFN-γ reagent set (Euroclone). Plasmids for in vitro transfection or mouse immunization were grown in Escherichia coli DH5α and purified using EndoFree Plasmid Maxi or Giga kits (Qiagen). Each lot of plasmid DNA had an A260/A280 ratio ≥1.8, as determined by UV spectrophotometry, endotoxin content ≤0.1 endotoxin U/μg DNA, as determined by a Limulus amebocyte lysate test (Pyrotell Assay; Associates of Cape Cod) and a predominantly supercoiled form. The ability of engineered DNA constructs to express functional peptide was analyzed by flow cytometry as described (15), using the following Abs for detection: Seam 3 or isotype control (4 μg/ml) and a mouse IgG-specific rabbit Ab conjugated to FITC (10 μg/ml; Abcam). The pCI-neo mammalian vector (empty vector) was used as a control. For DNA immunization, BALB/c mice (5–7 wk old; Charles River Laboratories) were immunized in the quadriceps muscle with 150 μg of purified DNA in a total volume of 50 μl of PBS. Mice were injected on days 0, 21, and 42 and tail vein bled on days 0, 36, and 56. In the coimmunization studies, 70 μg of pmIFN-γ were mixed with the immunizing plasmid (70 μg) and injected in a total volume of 50 μl. Moreover, groups of mice were immunized s.c. with 80 μg (peptide content) of 9M-KLH in CFA (Sigma-Aldrich) followed on days 21 and 42 by the same Ag dose in IFA. The DNA priming followed by peptide-boosting protocol involved i.m. immunization with pT.9M (150 μg) on days 0 and 21 followed by 9M-KLH (80 μg s.c. at day 42) in CFA. Serum samples from immunized animals were assayed for bactericidal activity as previously described (15). Briefly, the reciprocal of the highest final serum dilution causing >50% killing of the bacterial inoculum was recorded as the bactericidal titer. To assess inhibition of bactericidal activity, mixtures of 2-fold serial dilutions of inhibitor and diluted serum were preincubated for 20 min at 37°C before completing the bactericidal test. Isotype distribution of anti-9M Abs was determined by ELISA, using 9M-KLH (7 μg/ml) as coating Ag. Serum samples were diluted 1/100 in PBS supplemented with 10 μg/ml KLH before addition to the wells. The test was performed as previously described (11, 15). Anti-human PSA Abs were detected by using untreated or neuraminidase-treated neuroblastoma CHP 212 cells, expressing high levels of PSA, as described (11, 15). Anti-MenB CP Ab titers were determined by ELISA as described (11). A previously described infant rat model was used (15, 26). Briefly, 7-day-old Wistar rats (Charles River Laboratories) were inoculated i.p. with serially diluted mouse sera and, 2 h later, challenged i.p. with 2 × 103 CFU of MenB (strain 2996). Blood samples were obtained 18 h after challenge and the lowest plated dilution (1/10; 100 CFU/ml) was considered as the detection limit of the assay. Pups were considered protected from bacteremia in the presence of a sterile blood culture. All the animal experiments performed in the present study were approved by relevant authorities. Bactericidal titers were converted to log2 titer values to calculate means and SDs and to assess statistical significance using one-way ANOVA and Student-Keuls-Newman test. For the purpose of calculating means and SDs, sera with bactericidal activities below the detection threshold (i.e., with <50% killing in the first dilution) were given an arbitrary titer of 4.5, i.e., one-half of the first dilution. Differences in the frequency of positive bacterial cultures in the infant rat model were assessed by Fisher’s exact test. To obtain peptides mimicking a protective, nonhuman cross-reactive epitope of the MenB CP, a mAb, Seam 3 (8), recognizing such an epitope, was used as template. Two combinatorial phage display peptide libraries, based, respectively, on nonapeptides and dodecapeptides fused to the major coat protein (pVIII) of the M13 phage, were independently screened. After three rounds of selection using Seam 3 as bait, we obtained 13 phage clones, 2 from the dodecapeptide library and 11 from the nonapeptide library, which strongly reacted against Seam 3 (Fig. 1⇓), but not against an isotype-matched irrelevant mAb (data not shown). Moreover, binding of all clones was inhibited by purified MenB CP (Fig. 1⇓). These data suggest that the peptides mimic a capsular epitope recognized by the Seam 3 mAb. Binding of phage clones to Seam 3. Plates were sensitized with a mAb directed against phage protein III (1 μg/ml); 100 μl of purified phage clones (1010 PFU/ml) were added. After 1-h incubation, the Seam 3 mAb (1 μg/ml) was added in the presence (gray columns) or in the absence (patterned columns) of MenB CP (1 μg/ml). Binding was detected by using AP-conjugated anti-mouse IgG. Phage pC89, displaying wild-type pVIII, was used as negative control. Data represent the means ± the SD of three determinations. Next, PCR-amplified fragments containing the phage inserts were sequenced (Table II⇓). Of the 13 phage clones obtained, 3 (9M, 11M, and 12M) were found to express the sequence DYAWDQTHQ, 1 (8M) the sequence DYAWDDFYAMGD, 2 (20M and 21M), the sequence DAGEGGPRV, whereas the others express different sequences sharing the DAGE/D consensus motif also present in 20M and 21M. The less represented consensus sequence DYAWD (present in 8M, 9M, 11M, and 12M) is noticeable for the presence of tryptophan (W), which is relatively rare in the library inserts. Two clones (7M and 9M) representative of the two consensus sequences were selected for further studies. The ability of single mAbs, such as the Seam 3 mAb used here, to recognize different consensus sequences has been previously shown (16, 17, 18). Such property likely reflects the ability of random peptide libraries to provide more than one structural solution for functional mimicry of the mAb epitope (27). Oligodeoxynucleotides encoding 7M and 9M peptides were cloned in a mammalian vector suitable for DNA vaccination to produce p9M and p7M. A secretory leader sequence from adenovirus E3 or a Th sequence from tetanus toxoid or both were included in some DNA constructs, to increase exogenous expression and provide T cell help, respectively. The resulting plasmids with the respective inserts are listed in Table I⇑. The p9M and p7M plasmids were used to transiently transfect COS-7 cells, and protein expression was analyzed by using immunofluorescence, through the ability of permeabilized cells to be stained by the Seam 3 mAb. Cells transfected with plasmids showed increased fluorescence, when compared with cells transfected with the empty vector (pCI-neo), after treatment with the Seam 3 mAb followed by FITC-conjugated anti-mouse IgG (Fig. 2⇓). These data indicate that transfection with either p7M or p9M resulted in expression of the peptide mimotopes in functional form, as defined by their ability to bind to the Seam 3 idiotope. Similar data were obtained by using any of the plasmids listed in Table I⇑ (data not shown). Flow cytometric analysis of in vitro peptide expression. Binding of the Seam 3 mAb to permeabilized COS-7 cells transfected with expression plasmids containing the p7M or the p9M minigenes. Cells transfected with the empty vector (pCI-neo) were used as controls. After being transiently transfected, cells were permeabilized with Tween 20 and exposed to the Seam 3 mAb (4 μg/ml in PBS). FITC-conjugated anti-mouse IgG was used to detect binding. Horizontal lines indicate the gate that was defined to exclude background binding. Sera from mice immunized i.m. (three times at 21-day intervals) with the different plasmids were collected at 2 wk after the last immunization and assayed for their complement-dependent bactericidal activity. Fig. 3⇓a shows the results obtained after immunization with plasmids containing the 7M gene. Serum bactericidal activity was below the limits of detection of the assay in animals administered with the empty vector (pCI-neo; Fig. 3⇓a) or in preimmune serum samples (data not shown). Likewise, there was no detectable bactericidal activity in the sera of animals immunized with the two plasmids containing a secretory signal peptide before the 7M sequence (pS.7M and pST.7M, respectively, with and without the Th epitope). However, two and three of eight animals immunized with the respective plasmids devoid of the signal peptide (p7M and pT.7M) had moderate serum bactericidal activity. Coadministration of pT.7M and a plasmid containing the IFN-γ gene further increased the number of responding animals, whereas administration of pmIFN-γ alone did not induce bactericidal Abs (Fig. 3⇓a). 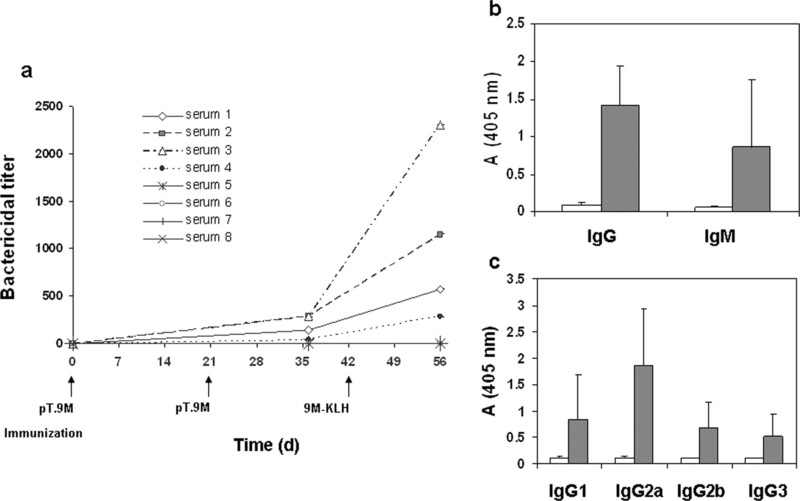 These data indicate that immunization with the 7M minigene fused to a T cell epitope sequence produced significant increases in serum bactericidal activity when coadministered with a vector expressing IFN-γ. Similar data were obtained after immunization with plasmids containing the 9M minigene (Fig. 3⇓b), but bactericidal titers were typically higher with this latter peptide in comparison to those observed after immunization with the 7M minigene. Three of the eight p9M-immunized animals showed increases in serum bactericidal activity. The presence of a Th epitope in pT.9M, further improved mean titers and percentage of responding animals. However, mean bactericidal titers in sera from pT.9M-immunized animals were still significantly lower than those observed after immunization with pT.scFvG1, which is a plasmid encoding the G1 scFv, another proposed immunogen (15; Fig. 3⇓b). Coadministration of pT.9M and a plasmid containing the IFN-γ gene increased the percentage of responding animals to 80%. Mean serum bactericidal titers observed under these conditions were comparable to those observed after immunization with pT.scFvG1. As previously observed with plasmids encoding for the 7M peptide, serum bactericidal responses were absent in animals immunized with vectors containing a secretory signal sequence (i.e., pS.9M and pST.9M; Fig. 3⇓b). Coimmunization with pT.9M, pT.7M, and pmIFN-γ did not increase bactericidal titers over the value observed after coimmunization with pT.9M and pmIFN-γ. Fig. 3⇓b also shows that immunization with the synthetic 9M peptide, conjugated to KLH, induced bactericidal activity in 50% of the animals. Serum bactericidal activity after immunization with the 7M or 9M minigenes. Bactericidal activity in sera from mice immunized with different plasmids containing the 7M (a) or 9M (b) sequences, with an empty vector (pCI-neo, used as a negative control) or with the pT.scFvG1 vector, used as a positive control. Plasmids (150 μg) were given three times i.m. and serum was collected at day 56 after the first immunization. In some experiments (pT.7M+pmIFN-γ, pT.9M+pmIFN-γ, or pT.9M+pT.7M+pmIFN-γ), mice were coadministered with 70 μg each of the indicated plasmids. For comparison, a group of animals was immunized three times with the 9M peptide conjugated to KLH (9M-KLH, 80 μg) using Freund’s adjuvant. To calculate mean geometric titers (horizontal bars), sera without detectable bactericidal activity were given an arbitrary titer of 4.5 (i.e., half of the reciprocal of the lowest dilution tested). For a description of the different plasmids, see Table I⇑. A value of p < 0.05 was significantly different by ANOVA and Student-Newman-Keuls test. In additional experiments, it was of interest to determine whether the animals that did not respond to pT.9M or 9M-KLH immunizations with the production of bactericidal Abs were unable to mount anti-9M peptide responses. This, however, was not the case, because there were no differences in anti-9M peptide Ab titers between sera with and without bactericidal activity (data not shown). In contrast, binding to MenB CP was weak or absent in nonbactericidal sera and was significantly lower than that of bactericidal sera (data not shown). These data are similar to those obtained in a previous study using a different mimic of the MenB CP (i.e., the G1 scFv; 15) and indicate that only a fraction of the anti-9M Abs cross-reacted with MenB. Next, we sought to confirm that the Ab response induced by immunization with the above constructs was directed against their intended target, i.e., the MenB CP. This was considered important because administration with cytokines can produce polyclonal activation. In a representative experiment the bactericidal activity induced by pT.9M-pmIFN-γ coimmunization was totally inhibited by purified MenB CP or by the 9M-KLH conjugate, but not by KLH alone (Fig. 4⇓a). Similar data were obtained with other randomly selected serum samples from the experiment reported in Fig. 3⇑b (data not shown). The bactericidal activity was specific for MenB and no cross-reaction was observed with MenA or MenC strains (Fig. 4⇓b). Moreover, these immune sera did not contain detectable levels of Abs directed against human PSA (Fig. 4⇓c). Collectively, the data indicate that pT.9M immunization can induce MenB CP-specific bactericidal Abs which do not cross-react with human PSA. Immunization with pT.9M plasmid induces capsule-specific Abs. a, Inhibition of bactericidal activity by purified MenB CP or 9M-KLH conjugate. KLH served as negative control. Shown is a representative experiment of three, each using a sample from a different pT.9M+pmIFN-γ-immunized animal. Serum was mixed with the inhibitors and tested at a final dilution of 1/100. The vertical axis shows bacterial numbers after completion of the bactericidal assay. b, Bactericidal activity against different meningococcal strains of sera from pT.9M+pmIFN-γ-immunized animals. Columns and bars represent means ± SD of three determinations each conducted on a different animal. c, Reactivity against human PSA of sera from pT.9M+pmIFN-γ-immunized animals. Neuraminidase-treated or untreated cells from the PSA-rich CHP 212 human neuroblastoma cell line were fixed to the wells of microtiter plates. Sera were diluted 1/20 and tested for binding to cell-coated plates by ELISA. Seam 3 and Seam 26 mAbs (5 μg/ml) were used, respectively, as negative and positive controls. Data represent means ± the SD of three determinations, each conducted on a different animal. d, Reactivity of rabbit anti-MenB serum against the 9M peptide mimic. A rabbit serum raised against MenB or normal rabbit serum (both diluted 1/1,000 in PBS) were added to wells sensitized with the 9M-KLH conjugate (5 μg/ml) or with KLH. Anti-MenB serum was used with or without pretreatment (1 h at 37°C) with 1 μg/ml purified MenB CP. Ab binding was detected by the addition of biotin-conjugated goat anti-rabbit IgG (diluted 1/10,000) followed by streptavidin-alkaline phosphate and p-nitrophenylphosphate. In additional experiments, it was of interest to ascertain whether anti-MenB CP Abs from species other than mouse could recognize the 9M mimic. Fig. 4⇑d shows that this was the case, as indicated by an ELISA in which a polyclonal anti-MenB rabbit serum, but not normal serum, reacted against the 9M-KLH conjugate. Moreover, in this assay, binding was inhibited by the addition of purified MenB CP (Fig. 4⇑d). These data are important because they indicate that the 9M peptide mimotope specifically interacts not only with the mAb used for its selection, but also with polyclonal MenB CP-specific rabbit Abs. Because the experimental results indicated that immunization with either the 9M peptide-KLH conjugate or pT.9M could induce significant serum bactericidal activity, we tested whether bactericidal titers could be further increased by priming with pT.9M followed by boosting with 9M-KLH. Bactericidal activity was observed in half of the animals after two administrations of pT.9M (Fig. 5⇓a). In these responders (serum samples 1–4), but not in the nonresponders (serum samples 5–8), boosting with 9M-KLH induced 4- to 8-fold increases in serum bactericidal activity. In contrast, homologous boosting (i.e., a third pT.9M administration) did not further increase serum bactericidal activity, but only prevented a decrease in bactericidal titers over the following weeks (data not shown). These data indicate that DNA priming followed by peptide boosting effectively increases bactericidal titers. Prime-boosting increases serum bactericidal activity and induces a Th1 response. a, Serum bactericidal activity in animals primed with pT.9M on days 0 and 21 and boosted with the 9M peptide conjugated with KLH (9M-KLH) at day 42. b and c, Isotype distribution of anti-9M Abs in sera from prime-boosted animals. Plates were sensitized with 9M-KLH (7 μg/ml) before the addition of sera diluted 1/100 in PBS supplemented with KLH (10 μg/ml). Plates were developed using isotype-specific reagents conjugated with alkaline-phosphatase. White and gray columns show the values of preimmune and immune sera, respectively. Data represent means ± SD of four determinations conducted on 56-day serum samples from the responder animals depicted in a. The Abs induced in animals primed with pT.9M and boosted with 9M-KLH were analyzed for their class/subclass distribution. After coating the plates with KLH-9M or with KLH alone, bound Abs were revealed with isotype-specific reagents. A weak response was observed in plates coated with KLH alone, which could be totally inhibited by the addition of KLH in the reaction mixture (10 μg/ml; data not shown). Fig. 5⇑b shows the reactivity of sera (diluted 1/100 in buffer containing 10 μg/ml KLH) from animals primed with pT.9M followed by immunization with 9M-KLH. Anti-9M Abs were mainly of the IgG class, with a predominance of IgG2a (Fig. 5⇑, b and c). In contrast, sera from animals undergoing gene vaccination alone (i.e., receiving p.T9M three times and no KLH-9M boost) showed either a prevalence of IgM or a mixed IgG response (data not shown). These data demonstrate that DNA priming followed by peptide boosting resulted in Th1-type Ab response. To further assess functional properties of the Ab responses induced by pT.9M immunization, we ascertained the ability of immune sera to passively protect infant rats from meningococcal bacteremia. In the experiments shown in Table III⇓, pups inoculated with up to a 1/4 dilution of a serum pool obtained from DNA-primed, peptide-boosted animals were indeed protected from bacteremia. 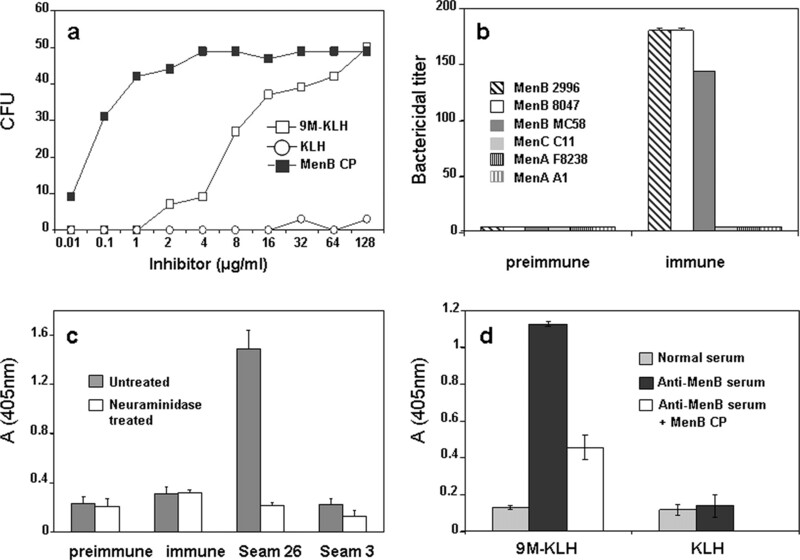 These data indicate that immunization with pT.9M induces serum Abs having a protective activity in a well-characterized animal model of MenB infection. No vaccine is available for the prevention of infections by MenB, which is responsible for up to 80% of meningococcal infections in developed countries (4). The MenB CP is an ideal target for immunization strategies, but it mostly shares epitopes with human tissue and is therefore nonimmunogenic. We here show that capsule-specific, serum bactericidal activity can be induced by immunization with peptide mimics of a non-cross-reactive epitope of MenB CP. The mimics, which were selected from combinatorial peptides libraries by using a mAb as bait, competed with the purified CP Ag for Ab binding and induced Abs capable of specifically killing group B (and not group A or C) meningococcal strains in the presence of complement. Moreover these Abs did not cross-react with human PSA and resulted protective in a well-characterized model of MenB infection, such as the infant rat model. These data confirm the feasibility of mimicking protective epitopes of the MenB CP while at the same time avoiding the risk of autoimmunity, as previously shown using anti-idiotypic vaccination with scFv encoding genes (11, 15). The mean bactericidal titers observed after vaccination with minigenes encoding for the 9M peptide were lower than those observed after anti-idiotypic immunization. However, the use of peptides, in place of scFvs, should offer considerable advantages, including the absence of unwanted, potentially immunogenic epitopes, such as those of variable domain framework regions. Concerns over the induction of potentially harmful human anti-mouse and human autoreactive Abs may complicate the use of, respectively, murine and human scFvs as vaccines in humans. More importantly for practical applications, peptides can be manufactured easily, safely and economically by chemical synthesis. Peptides capable of binding to MenB-specific Abs had been previously identified (9, 23), but they do not share any obvious sequence similarity with the ones described here. Moreover, previously identified peptides lacked immunogenic properties (9, 23). This is not surprising, because only a minority of selected peptide mimotopes have the ability to induce an immune response, as shown by an early report (16). In the present study, after isolating immunogenic peptides, we took advantage of their versatility to screen a number of vaccination strategies and found that each of these had distinctive effects. For example, coadministration of an IFN-γ-encoding plasmid markedly increased the number of responding animals, but only moderately increased bactericidal titers over those observed after administration of peptide minigenes alone. Conversely, DNA priming followed by boosting with peptide-carrier conjugates did not raise the frequency of responding animals, but consistently increased the bactericidal titers of the responders. Both heterologous prime boosting and cytokine coadministration have been previously used with variable success to enhance cell-mediated responses against viruses and other intracellular pathogens (28). Our data indicate that these two strategies may also be useful (and may actually have synergistic effects) in the challenging task of inducing protective Ab responses using peptide mimotopes as immunogens. Prime boosting was of special interest because, in addition to increasing bactericidal titers, it induced a Th1-type response with a predominance of IgG2a. This is a desirable feature, because carbohydrate vaccines have limited ability to induce IgG2a, even after protein conjugation (29). Moreover, this murine isotype is particularly effective in mediating complement fixation, opsonization, and protection against encapsulated organisms (30). Immunization with peptide minigenes alone (i.e., DNA vaccination without protein boosting) has been previously used to redirect a carbohydrate cross-reactive Ab response toward a Th1-type response (24). However, this is not a constant feature of DNA vaccination, because immunization with a minigene encoding a peptide mimic of the MenC CP resulted in a T-independent, IgM-dominated response, which developed into a mixed Th1-Th2 IgG response only after pathogen challenge (31). Accordingly, in the present study, DNA immunization alone resulted in an IgM-type response in some animals and in a mixed IgG response in others. However, boosting with a carrier peptide conjugate uniformly redirected such responses toward a Th1, IgG2a-dominated type. Another successful strategy used here, as to increase immunogenicity of the peptide mimotopes, is based on avoiding the use of signal peptide sequences in DNA vaccination vectors. Such leader sequences are generally used to direct the Ag into the endoplasmic reticulum of transfected cells, thus leading to secretion, with the rationale of increasing availability of the immunogen to APCs. In the present study, however, using two different mimotopes (7M and 9M), bactericidal responses were abrogated when a signal peptide sequence was placed in front of the antigenic sequences (Fig. 3⇑). We have observed a similar effect using different signal peptides (our unpublished observations) and antigenic mimics (15). Therefore, increased intracellular, as opposed to extracellular, targeting of peptide mimics may represent a viable strategy to increase their immunogenicity, although additional studies are required to clarify the mechanism underlying such effect. In the present study, a fraction of the animals did not produce any detectable amount of bactericidal Abs after pT.9M or 9M-KLH vaccination despite using different immunization strategies. In view of recent advances in the delivery of DNA vaccines, further studies are advisable, as to examine whether alternative approaches (such as gene gun or electroporation) can increase the frequency of responders and/or mean bactericidal titers. At present stage, it is clearly too early to speculate on the feasibility of using the peptides described here as leads for development of human anti-MenB vaccines. However, the potential advantages of these vaccine candidates are readily apparent in terms of ease of production, safety, and adaptability to different immunization strategies. For example, these peptides are ideally suited to be expressed as fusion products with other antigenic sequences designed to protect against MenB or other pathogens. Promising protein candidates for an anti-MenB vaccine have been identified by a genomic approach (32), and the inclusion of a capsule-based immunogen in such vaccine formulation may be useful to prevent the emergence of mutant strains in vaccinated populations and, likely, to increase protective efficacy. Finally, several strategies may be easily applied to improve the properties of these peptides and to engineer further refined, second-generation mimics that would more closely resemble the natural Ag. Recent studies convincingly demonstrate the feasibility of reaching this goal by design, i.e., based on detailed structural analysis of the interactions of the nominal Ag and its mimics with the Ab-combining site (33). We thank Rino Rappuoli for helpful discussion. Marzia Monica Giuliani is acknowledged for advice with the bactericidal assay and for providing bacterial strains. We gratefully thank Antonella Bartoloni and Massimo Mariani for providing purified polysaccharide and Abs. ↵2 Abbreviations used in this paper: CP, capsular polysaccharide; MenB, Neisseria meningitidis serogroup B; PSA, polysialic acid; scFv, single chain variable fragment; KLH, keyhole limpet hemocyanin; pmIFN-γ, plasmid encoding for murine IFN-γ. World Health Organization. 2001. Weekly epidemiological record. 37: 281–288. Van Deuren, M., P. Brandtzaeg, J. W. Van Der Meer. 2000. Update on meningococcal disease with emphasis on pathogenesis and clinical management. Clin. Microbiol. Rev. 13: 144-166. Poolman, J. T., P. A. Van Der Ley, J. Tommassen. 1995. Surface structures and secreted products of meningococci. K. Cartwright, ed. Meningococcal Disease 21-34. Wiley, New York. Rosenstein, N. E., B. A. Perkins, D. S. Stephens, T. Popovic, J. M. Hughes. 2001. Meningococcal disease. N. Engl. J. Med. 344: 1378-1388. Jodar, L., I. M. Feavers, D. Salisbury, D. M. Granoff. 2002. Development of vaccines against meningococcal disease. Lancet 359: 1499-1508. Morley, S. L., A. J. Pollard. 2001. Vaccine prevention of meningococcal disease, coming soon?. Vaccine 20: 666-687. Finne, J., M. Leinonen, P. H. Makela. 1983. Antigenic similarities between brain components and bacteria causing meningitis: implications for vaccine development and pathogenesis. Lancet 2: 355-357. Granoff, D. M., A. Bartoloni, S. Ricci, E. Gallo, D. Rosa, N. Ravenscroft, V. Guarnieri, R. C. Seid, A. Shan, W. R. Usinger, et al 1998. Bactericidal monoclonal antibodies that define unique meningococcal B polysaccharide epitopes that do not cross-react with human polysialic acid. J. Immunol. 160: 5028-5036. Shin, J. S., J. S. Lin, P. W. Anderson, R. A. Insel, N. H. Nahm. 2001. Monoclonal antibodies specific for Neisseria meningitidis group B polysaccharide and their peptide mimotopes. Infect. Immun. 69: 3335-3342. Pon, R. A., M. Lussier, Q. L. Yang, H. I. Jennings. 1997. N-propionylated group B meningococcal polysaccharide mimics a unique bactericidal capsular epitope in group B Neisseria meningitidis. J. Exp. Med. 185: 1929-1938. Beninati, C., S. Arseni, G. Mancuso, W. Magliani, S. Conti, A. Midiri, C. Biondo, L. Polonelli, G. Teti. 2004. Protective immunization against group B meningococci using anti-idiotypic mimics of the capsular polysaccharide. J. Immunol. 172: 2461-2468. Park, I. H., J. H. Youn, I. H. Choi, M. H. Nahm, S. J. Kim, J. S. Shin. 2005. Anti-idiotypic antibody as a potential candidate vaccine for Neisseria meningitidis serogroup B. Infect. Immun. 73: 6399-6406. Magliani, W., L. Polonelli, S. Conti, A. Salati, P. F. Rocca, V. Cusumano, G. Mancuso, G. Teti. 1998. Neonatal mouse immunity against group B streptococcal infection by maternal vaccination with recombinant anti-idiotypes. Nat. Med. 4: 705-709. Beninati, C., M. R. Oggioni, M. Boccanera, M. R. Spinosa, T. Maggi, S. Conti, W. Magliani, F. De Bernardis, G. Teti, A. Cassone, et al 2000. Therapy of mucosal candidiasis by expression of an anti-idiotype in human commensal bacteria. Nat. Biotechnol. 18: 1060-1064. Beninati, C., A. Midiri, G. Mancuso, C. Biondo, M. Arigò, E. Gerace, S. Papasergi, M. Gambuzza, M. Boretti, W. Magliani, et al 2006. Antiidiotypic DNA vaccination induces serum bactericidal activity and protection against group B meningococci. J. Exp. Med. 203: 111-118. Phalipon, A., A. Folgori, J. Arondel, G. Sgaramella, P. Fortugno, R. Cortese, P. J. Sansonetti, F. Felici. 1997. Induction of anti-carbohydrate antibodies by phage library-selected peptide mimics. Eur. J. Immunol. 27: 2620-2625. Valadon, P., G. Nussbaum, L. F. Boyd, D. H. Margulies, M. D. Scharff. 1996. Peptide libraries define the fine specificity of anti-polysaccharide antibodies to Cryptococcus neoformans. J. Mol. Biol. 261: 11-22. Falklind-Jerkerus, S., F. Felici, C. Cavalieri, C. Lo Passo, G. Garufi, I. Pernice, M. M. Islam, F. Qadri, A. Weintraub. 2005. Peptides mimicking Vibrio cholerae O139 capsular polysaccharide elicit protective antibody response. Microbes Infect. 7: 1453-1460. Scott, J. K., G. P. Smith. 1990. Searching for peptide ligands with an epitope library. Science 249: 386-390. Felici, F., L. Castagnoli, A. Musacchio, R. Jappelli, G. Cesareni. 1991. Selection of antibody ligands from a large library of oligopeptides expressed on a multivalent exposition vector. J. Mol. Biol. 222: 301-310. Luzzago, A., F. Felici. 1998. Construction of disulfide-constrained random peptide libraries displayed on phage coat protein VIII. Methods Mol. Biol. 87: 155-164. Rowley, M. J., K. O’Connor, L. Wijeyewickrema. 2004. Phage display for epitope determination: a paradigm for identifying receptor–ligand interactions. Biotechnol. Ann. Rev. 10: 151-188. Moe, G. R., S. Tan, D. M. Granoff. 1999. Molecular mimetics of polysaccharide epitopes as vaccine candidates for prevention of Neisseria meningitidis serogroup B disease. FEMS Immunol. Med. Microbiol. 26: 209-226. Kieber-Emmons, T., B. Monzavi-Karbassi, B. Wang, P. Luo, D. B. Weiner. 2000. Cutting edge: DNA immunization with minigenes of carbohydrate mimotopes induce functional anti-carbohydrate antibody response. J. Immunol. 165: 623-627. Tymciu, S., C. Durieux-Alexandrenne, A. Wijkhuisen, C. Creminon, Y. Frobert, J. Grassi, J. Y. Couraud, D. Boquet. 2004. Enhancement of antibody responses in DNA vaccination using a vector encoding a universal T-helper cell epitope. DNA Cell Biol. 23: 395-402. Welsch, J. A., G. R. Moe, R. Rossi, J. Adu-Bobie, R. Rappuoli, D. M. Granoff. 2003. Antibody to genome-derived neisserial antigen 2132, a Neisseria meningitidis candidate vaccine, confers protection against bacteremia in the absence of complement-mediated bactericidal activity. J. Infect. Dis. 188: 1730-1740. Keitel, T., A. Kramer, H. Wessner, C. Scholz, J. Schneider-Mergener, W. Hohne. 1997. Crystallographic analysis of anti-p24 (HIV-1) monoclonal antibody cross-reactivity and polyspecificity. Cell 91: 811-820. Woodland, D. L.. 2004. Jump-starting the immune system: prime-boosting comes of age. Trends Immunol. 25: 98-104. Buchanan, R. M., B. P. Arulanandam, D. W. Metzger. 1998. IL-12 enhances antibody responses to T-independent polysaccharide vaccines in the absence of T and NK cells. J. Immunol. 161: 5525-5533. Seppala, I., J. Pelkonen, O. Makela. 1985. Isotypes of antibodies induced by plain dextran or a dextran-protein conjugate. Eur. J. Immunol. 15: 827-833. Westerink, M. A., D. M. Prinz, S. L. Smithson, T. Kieber-Emmons. 2003. Induction of a protective capsular polysaccharide antibody response to a multiepitope DNA vaccine encoding a peptide mimic of meningococcal serogroup C capsular polysaccharide. Immunology 110: 242-249. Pizza, M., V. Scarlato, V. Masignani, M. M. Giuliani, B. Arico, M. Comanducci, G. T. Jennings, L. Baldi, E. Bartolini, B. Capecchi, et al 2000. Identification of vaccine candidates against serogroup B meningococcus by whole-genome sequencing. Science 287: 1816-1820. Vyas, N. K., M. N. Vyas, M. C. Chervenak, D. R. Bundle, B. M. Pinto, F. A. Quiocho. 2003. Structural basis of peptide-carbohydrate mimicry in an antibody-combining site. Proc. Natl. Acad. Sci. USA 100: 15023-15028.